Meiji metallurgical binocular compound microscope with Plan EPI Infinity-corrected Objectives, 500x magnification, flat-top stage, Koehler vertical 30W Halogen illumination and coaxial, graduated focus controls. Lifetime Limited Warranty. 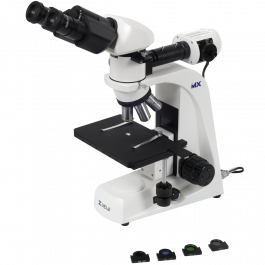 The Meiji MT7000 series microscope line delivers robust performance, features and versatility at a price point well below other similarly-equipped instruments. 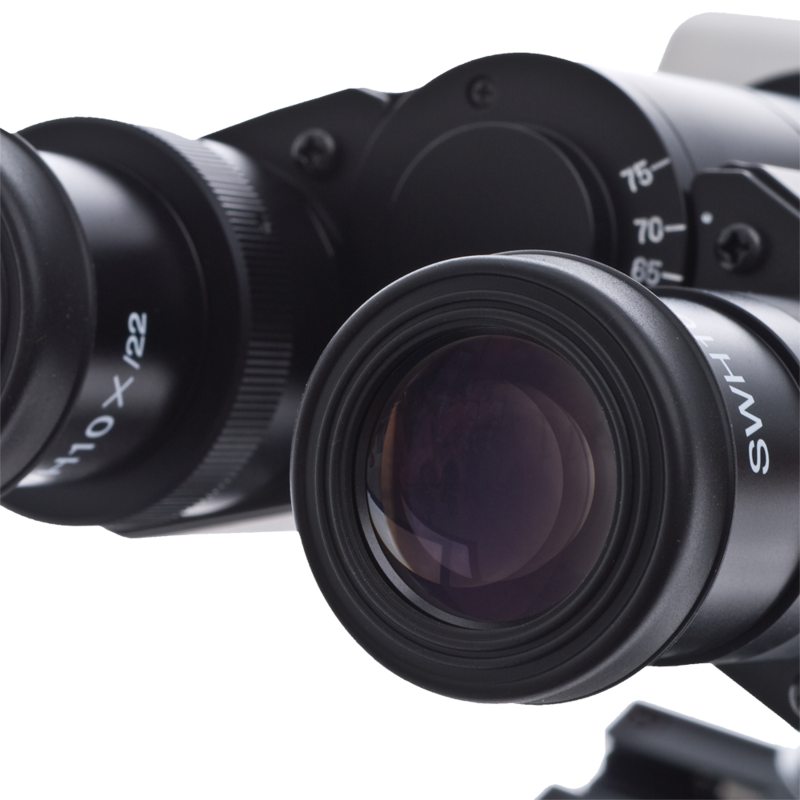 The optical heart of the MT7000 features 10X Super Widefield High Eyepoint eyepieces and (4) Plan EPI infinity-corrected brightfield objectives (5x, 10x, 20x, 50x) set in a ball bearing-driven quintuple nosepiece. The viewing head is inclined 30 degrees for viewing comfort and includes inter-pupillary adjustment of 53-75mm and graduated diopter settings on the left eye tube. Illumination is provided by a powerful, variable intensity, 30W Koehler Halogen illuminator, voltage-controlled for dependability. The fixed mechanical stage offers 191mm x 126mm of ceramic-coated surface area and 100mm by 100mm movement in the X-Y axis. Ergonomically positioned coaxial drop-down controls allow for exact positioning of the specimen. For digital imagery work, an optional trinocular head features a sliding beam splitter which directs 100% of the light to the eyepieces or 80% to the trinocular port and 20% to the right eyepiece. The integrated front-mounted camera port and available adapters allow image capture from conventional 35mm, CCD and CMOS digital cameras. Meiji metallurgical trinocular compound microscope with Plan EPI Infinity-corrected Objectives, 500x magnification, flat-top stage, Koehler vertical 30W Halogen illumination and coaxial, graduated focus controls. Lifetime Limited Warranty. The Meiji MT7000 series microscope line delivers robust performance, features and versatility at a price point well below other similarly-equipped instruments. 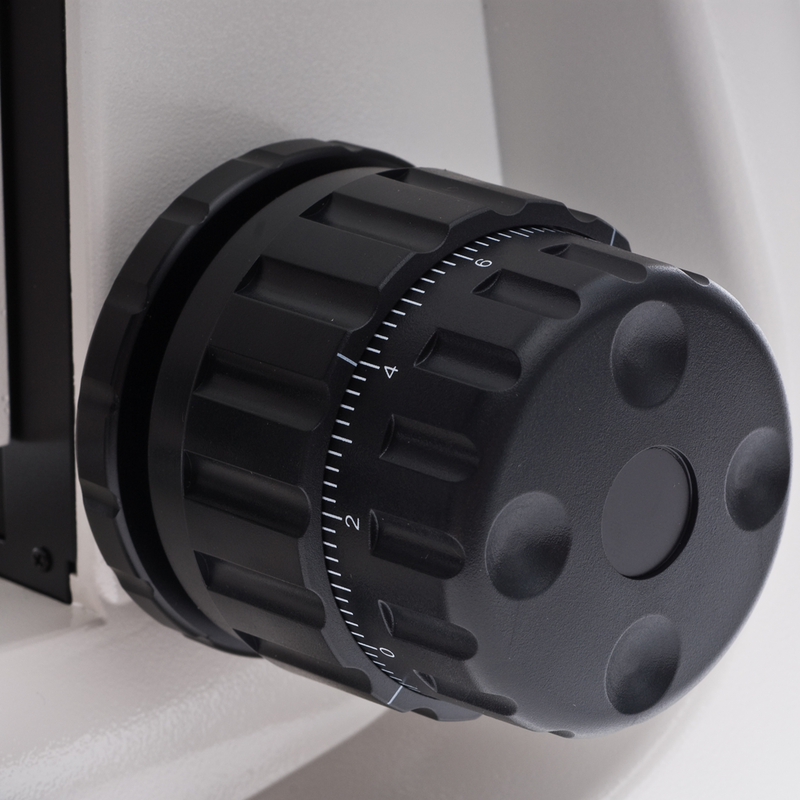 The optical heart of the MT7100 features 10X Super Widefield High Eyepoint eyepieces and (4) Plan EPI infinity-corrected brightfield objectives (5x, 10x, 20x, 50x) set in a ball bearing-driven quintuple nosepiece. The trinocular head is inclined 30 degrees for viewing comfort and includes inter-pupillary adjustment of 53-75mm and graduated diopter settings on the left eye tube. Illumination is provided by a powerful, variable intensity, 30W Koehler Halogen illuminator, voltage-controlled for dependability. For digital imagery work, the trinocular head features a sliding beam splitter which directs 100% of the light to the eyepieces or 80% to the trinocular port and 20% to the right eyepiece. The integrated front-mounted camera port and available adapters allow image capture from conventional 35mm, CCD and CMOS digital cameras. 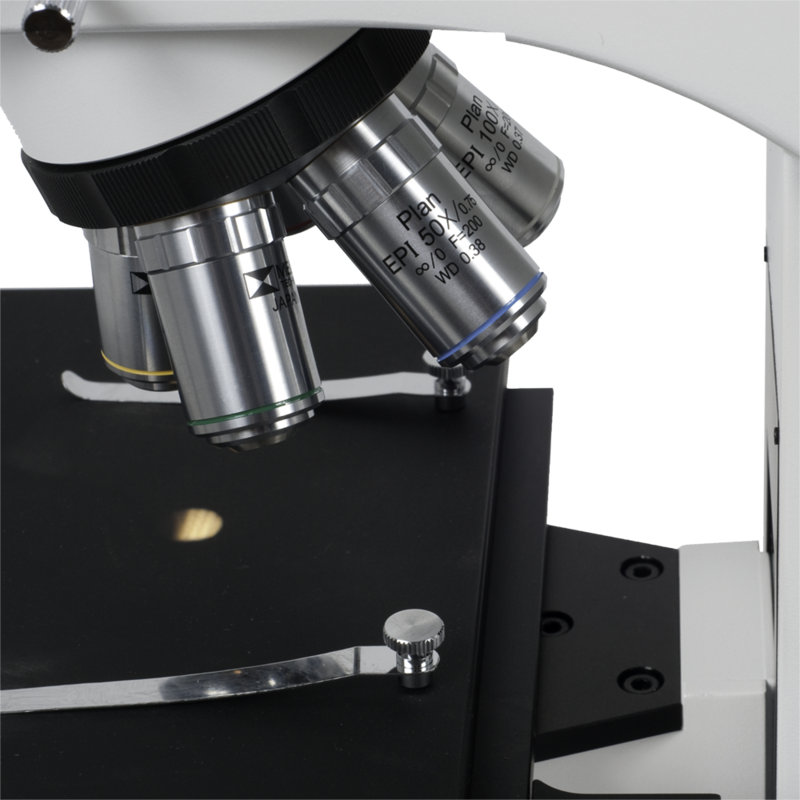 The MT7000 series are metallurgical microscopes purpose-built for incident (reflected) light observation of opaque materials such as metals, minerals and crystalline samples. Available in either binocular or trinocular format, they include Meiji's infinity corrected optical system with four Plan Epi objectives and two SWH 10x eyepieces for magnification levels of 50x, 100x, 200x and 500x. Lifetime Limited Warranty. A Siedentopf-type binocular head is available in binocular or trinocular format. The oculars are inclined at 30° with a diopter on the left ocular for individual eye focusing. Interpupillary adjustment is 53mm - 75mm. 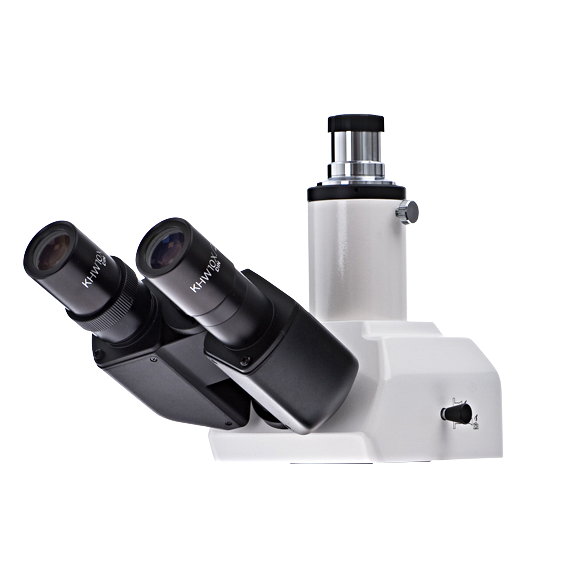 Two SWH 10x eyepieces (FN 22) are included. The four objectives are infinity corrected Plan Epi 5x, 10x, 20x, and 50x set in a ball-bearing mounted quintuple nosepiece. An 80/20 beamsplitter for the trinocular tube can be engaged for photo work. (100% to eyetubes or 80% to phototube & 20% to the eyetube.) 30mm ID eyetube. Please note that the trinocular port requires an adapter appropriate for your camera. The mechanical stage is ceramic-coated and measures 191mm x 126mm. The range of movement is 100mm x 100mm and is includes low position drop down coaxial controls for X-Y movement. Focus controls are dual-sided with coaxial coarse/fine knobs. Vertical Koehler illuminator with 6V 30 Watt halogen lamp with clear blue, clear green, ND 50 neutral density filter and polarizing filters in metal mounts. Universal 110-240V voltage.